Tennessee State Rep. William Lamberth carefully listens to the concerns of FWE owner Deron Lichte, among other constituents. 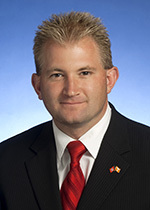 Rep Lamberth takes swift, positive action to correct an oversight in the cost of doing business in Tennessee. Rep. Lamberth’s recent action in support of HB1386 will help future businesses and organizations relocating to Tennessee. Transmitted to Tennessee Governor Bill Haslam for his action, House Bill 1386 enacts and establishes an “experience rating” applicable to new employers moving to Tennessee. This would apply to relocating businesses with a well established track record, having been in operation for at least three years prior to becoming a employer in Tennessee. The cost benefit would correlate to millions of dollars saved, by future employers. Money that will go toward employing local workers through direct employment, as well as goods and services within the local economy. This, to the benefit of the entire Middle Tennessee economy. Food Warming Equipment Co. applauds Tennessee State Rep. William Lamberth for his swift and resolute action that will go to for toward boosting corporate recruitment. More importantly, Rep. Lamberth has proven himself to be an acute listener of his constituency to the benefit of all. It is obvious he understands how real business is conducted and responds accordingly. Perhaps it is due to actions like this that Forbes ranks Nashville, TN as one of the biggest Boom Towns in America. FWE supports Tennessee, it’s leaders, and residents and hopes for a very long and prosperous future for everyone. As this recent legislative action is not retroactive, FWE will not benefit from this recent change. However we are still very pleased to see decisive action taken in what may have been seen by many as an arbitrary and punitive hidden tax, ex post facto. We hope that all businesses relocating to Tennessee will benefit from this and reinvest this corrective savings back into the greater Tennessee economy. Next Next post: Operation Brooke: Teaming up with the American Cancer Society’s Relay for Life.